Everglades Seasoning's All Purpose seasoning is an aromatic blend that is suitable for a variety of uses. The original blend is quite salty. While containing many other ingredients, I've found this seasoning's best use is as a salt alternative. Just use it in any situation that you would normally use salt and pepper. Because of the salt content, I shy away from using too much of it on meat. I prefer Everglades Seasoning's All Purpose Seasoning on vegetables. It's particularly good on potatoes. Add a dash to homemade french fries or a baked potato. If you're looking for a convienent product that will save you from buying individual bottles of various seasonings, Everglades Seasoning's All Purpose Seasoning is a good option. 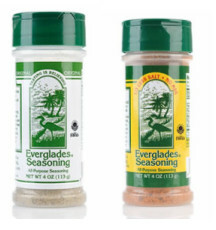 You can find Everglades Seasoning in grocery stores throughout the South East and beyond. You can also order online using their website. 0 Response to "Everglades All Purpose Seasoning"